Charolette's family wishes to thank Warren Emergency Squad, Marietta Memorial Emergency and Care Unit staff, as well as Dr. James Allen of Ohio State James Cancer Center. Charolette felt that a group of angels had been sent to help in her journey home. 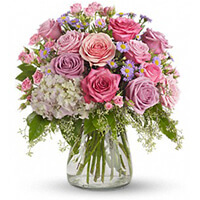 To send flowers to the family of Charolette Ann Carr (Fincham), please visit our Heartfelt Sympathies Store. We encourage you to share any memorable photos or stories about Charolette. All tributes placed on and purchased through this memorial website will remain on in perpetuity for future generations. Rodney & Family I am so sorry for your loss. I grew up with Charolette. I know how pretty she was and what a nice family she came from. So very sorry for your loss. Death cannot erase all the wonderful memories with your family. Charlotte's love and laughter remains in our hearts and minds forever. God bless. Rodney and family, I am so sorry to hear about Charolette passing. She was a wonderful lady and greeted you with a smile. She will be missed by many. Denise and Family, We are so sorry for your loss. You are in our thoughts and prayers.